The Yukon Mining Renaissance | Energy and Gold Ltd.
It’s been more than 120 years since George Carmack, Skookum Jim, Kate Carmack, and Dawson Charlie found gold along Bonanza Creek (one of the Klondike River’s tributaries), but the Klondike Gold Rush is still alive and well in Canada’s Yukon Territory. During my visit to the Yukon last summer, as part of the Yukon Mining Tour, I felt the mining history everywhere we went. The sheer size of the Yukon is impressive (nearly 500,000 square kilometers) and it’s hard to believe that there aren’t more world-class mineral discoveries just waiting to be uncovered in this Canadian territory. In the past decade, there has been a tremendous drive from both the federal and territorial governments to stimulate mining investment and exploration in the Yukon. In September 2017, the Canadian Prime Minister Justin Trudeau announced a C$360 million “Roads to Resources” program, which will upgrade more than 650 kilometers of roads in the territory, and build or replace numerous bridges, culverts, and stream crossings in two minerals-rich regions of the Yukon. 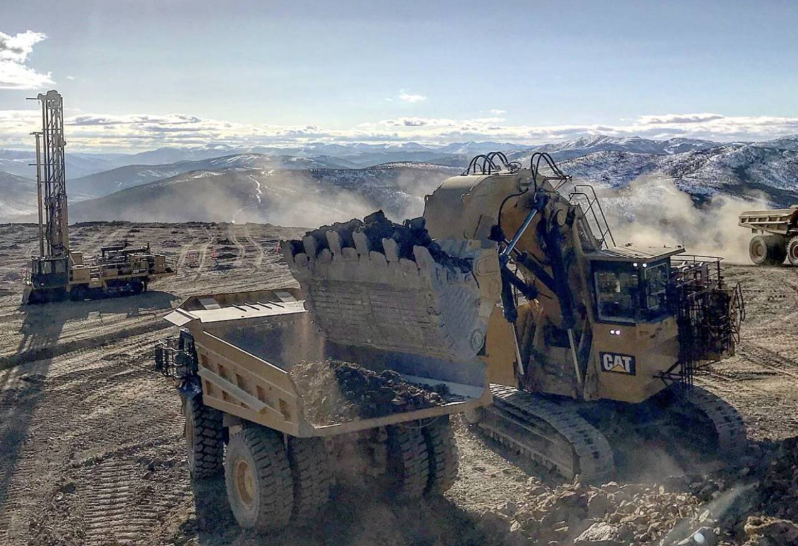 The Roads to Resources program is critical for the mining industry in the Yukon because the relative scarcity of infrastructure is one of the main obstacles in the way of having more economic mining projects in the Territory. Since the Roads to Resources program was announced in September 2017, we have seen a bit of a renaissance in Yukon mineral exploration; there are more than a dozen high-quality gold explorers and developers (Alexco Resources and White Gold Corp, to name a couple) that are advancing highly prospective precious metals projects in the Yukon. 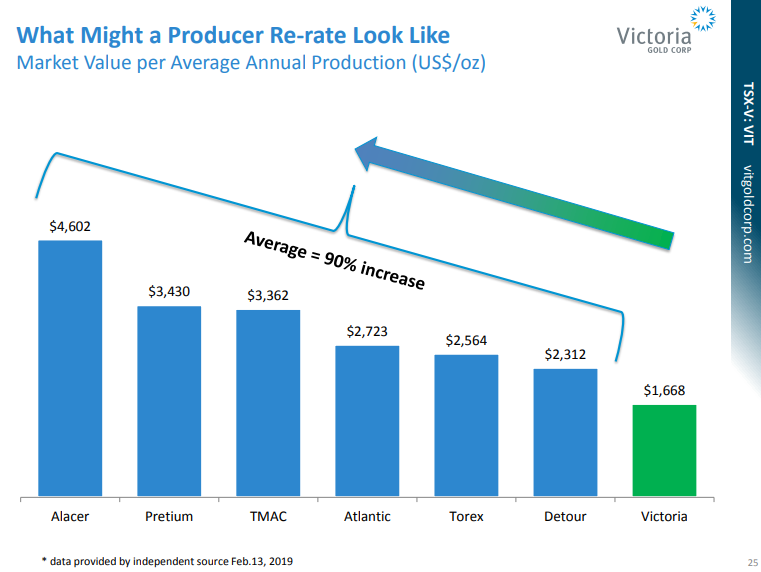 In addition, Victoria Gold (TSX-V:VIT) is about to become Canada’s next gold producer, with first gold pour expected in Q3 of this year. 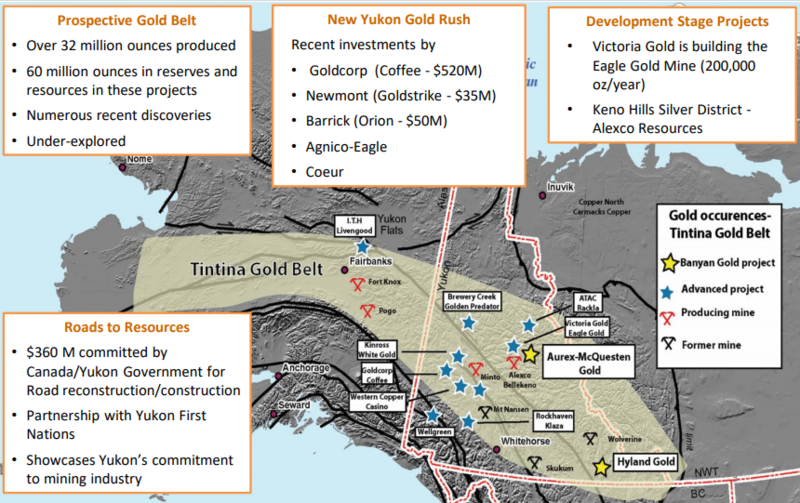 Eagle Gold will be the largest gold mine in the history of the Yukon. Eagle Gold will be Canada’s next producing gold mine. Eagle Gold boasts 2.5 million proven and probable ounces of gold, with an additional 1+ million ounces measured & indicated. Industry low waste-to-ore ratio of less than 1:1. The “producer rerate” is one of the classic investment cases in the mining sector, as there’s nothing like metals production generating cash flow to gain the attention of a larger audience of investors. Some large investors are only permitted to own producers (by investment mandate), and the transition from developer to producer opens up a whole new set of investors and capital who can buy a company’s stock. With two new precious metals producers set to be in full production by year end, the Yukon is experiencing a mining renaissance. 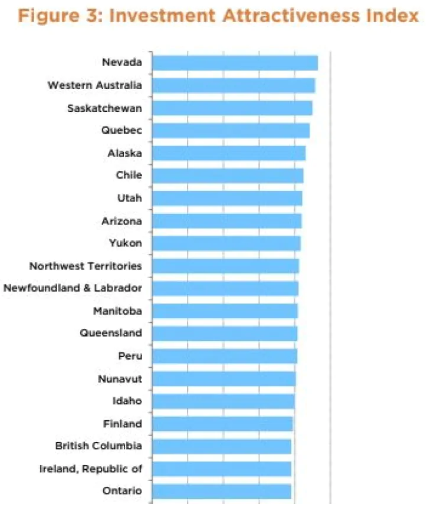 Not only are there new Yukon producers, but the Yukon is also experiencing an increase in the number of high-quality exploration companies that have highly prospective projects. Most of the biggest and most profitable mineral deposits in the Yukon are located along what is known as the Tintina Gold Belt, which is home to the Fort Knox (nearly 10 million ounces of gold produced to date) and Pogo (nearly 5 million ounces of gold resources & reserves) mines on the US side of the border. 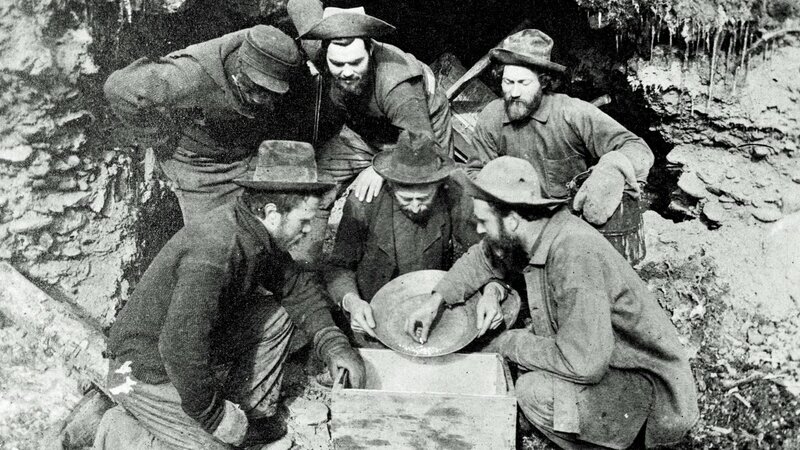 Since the Klondike Gold Rush began in 1896, it’s believed that nearly 20 million ounces of gold have been extracted from the earth in the Yukon Territory of Canada (not including the nearly 50 million ounces that have been mined in neighboring Alaska). More importantly, there is evidence that there is substantially more than 50 million ounces of gold still left in the ground in the Yukon. 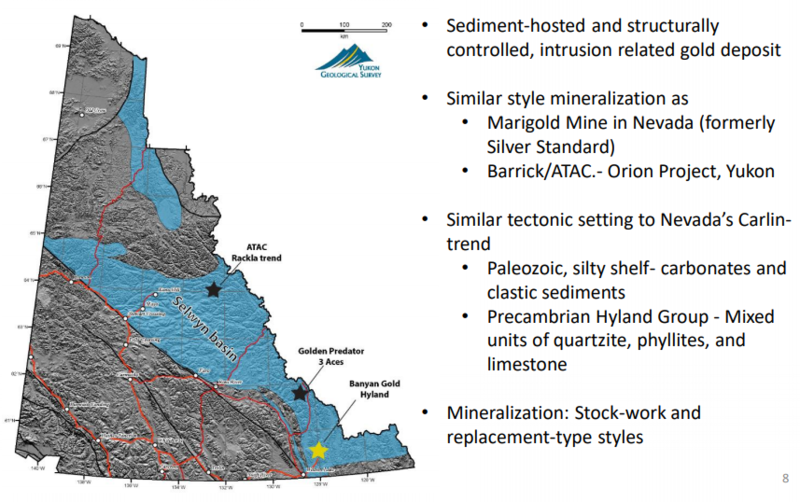 Banyan Gold (TSX-V:BYN, OTC: BYAGF) has a C$4.8 million market cap (fully diluted at a C$.04 share price) and its Aurex McQuesten Project (AurMac) in the Keno Hill Silver District of the Yukon is in the middle of the Yukon’s hottest new mining district, with much larger market cap companies surrounding it on all sides. Aurex McQuesten also has a significant infrastructure advantage, with highway and power lines that run right through the property. 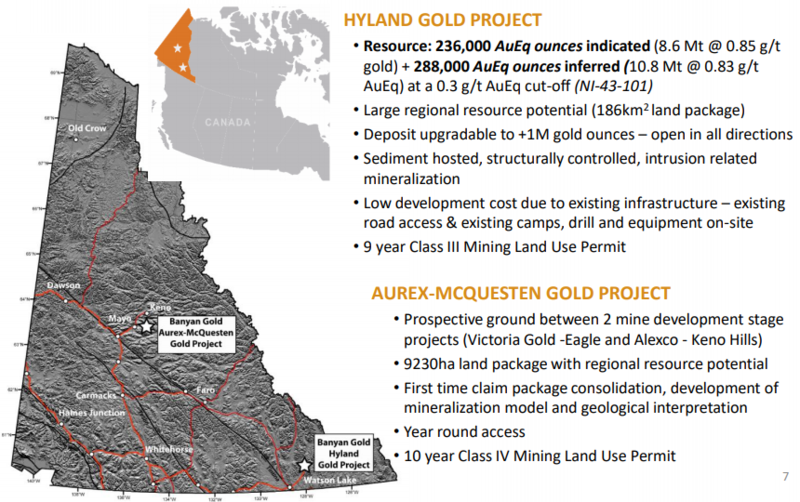 Banyan is planning to drill a higher grade gold target at its McQuesten target and also drill its Aurex Hill target, as part of its phase 2 drill program at AurMac in June (8-10 holes, 1,200 meters), with the aim of getting closer to being able to put together a maiden resource estimate there. Metallurgical work has also shown average oxide gold recoveries of 86% which means that Hyland can be exploited as an open pit, heap leach mining operation. There are numerous open pit heap leach mines in Nevada operating with gold grades below .5 grams/tonne, and 1 gram/tonne gold is considered to be an excellent grade for an open pit heap leachable deposit – Hyland’s average gold-equivalent grade of .85 grams/tonne is a good grade for an open pit heap leach mining scenario. Both Alexco and Victoria Gold are Banyan shareholders with Alexco holding nearly 10% of BYN shares and Victoria holding 5.6%. Banyan CEO Tara Christie also owns nearly 5% of Banyan shares on a fully diluted basis. Add in other insiders and nearly 30% of Banyan shares are in extremely strong hands. At its recent share price of C$.04 Banyan Gold’s market cap is less than C$5 million (~121 million shares fully diluted). This means that the market is valuing Banyan’s 43-101 compliant gold ounces at Hyland at less than C$10 per ounce while giving Banyan zero value for its AurMac Project. Given its prime location (in the middle of an emerging mining district) and the fact that C$7 million has been spent on exploring the property package by previous owners, from my vantage point AurMac is worth at least as much as Banyan’s total market cap right now (C$4.7 million). Especially considering that there will be two operating mills within trucking distance by the end of 2019, another source of ore could be quite valuable to either Alexco or Victoria in the future. 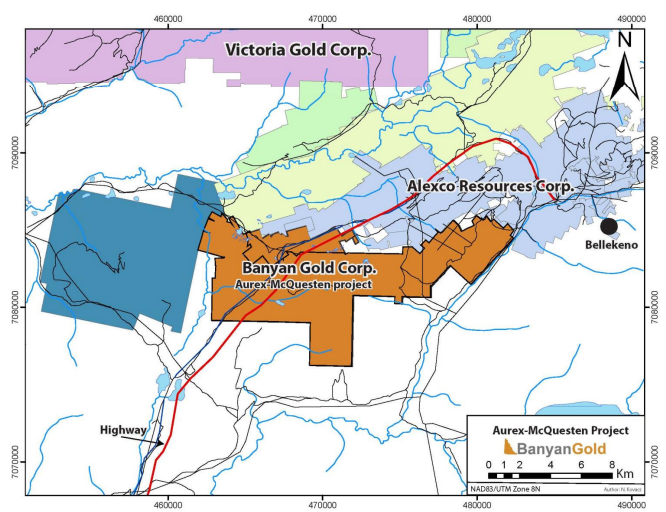 Banyan has about C$600,000 in the treasury which will be sufficient to carry out drilling and field work at AurMac in May/June (Banyan has low drilling costs at AurMac due to its partnerships with Alexco & Victoria and its excellent location near major roads and infrastructure), at which point the company will reassess market conditions and other opportunities (including potential JV opportunities). Investing is all about risk vs. reward and in my estimation the downside risk in Banyan shares at C$.04 per share is about as low as it gets in the junior mining sector, whereas the upside potential is significant. While some may laugh at the possibility of BYN being a 10-bagger (900%+ increase from its current share price) there are several scenarios which could lead to Banyan reaching a C$.40 share price, including substantial exploration success at AurMac and/or further expansion at Hyland which enables Banyan to reach the ‘critical mass’ (one million ounces) required to garner more attention from producers and achieve a rerating to the average per ounce valuation for its peer group (C$40 per ounce for measured & indicated gold ounces). Both of Banyan’s projects have road access with camps & equipment on site. Hyland has a similar tectonic setting to Nevada’s prolific Carlin Trend and what’s even better is that the vast majority of gold mineralization at Hyland is near surface (75 meters depth or less) and the bulk of the resource is oxide which means that it is amenable to heap leaching (metallurgical testing has yielded gold recoveries of 86%). 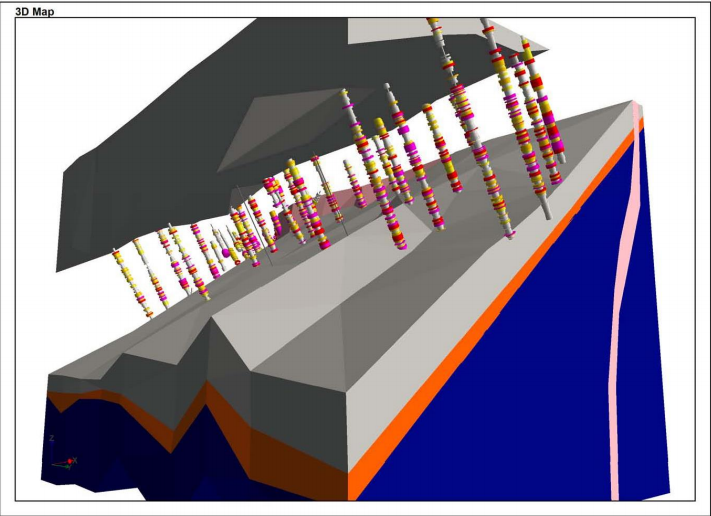 Meanwhile, AurMac is in the Mayo Mining District (home to Alexco Resources and Victoria Gold) and the property has undergone at least three stages of mineralization which host gold, silver, and zinc/lead veins (Keno Hill style siderite). Hyland is open in all directions which makes the 1,000,000 ounce total resource number quite attainable, particularly considering Hyland’s 186 square kilometer land package. At AurMac Banyan has a straightforward path to a maiden resource estimate, through consolidating the more than C$7 million of historical exploration work that has been carried out on the property package, in addition to the work that Banyan has carried out. 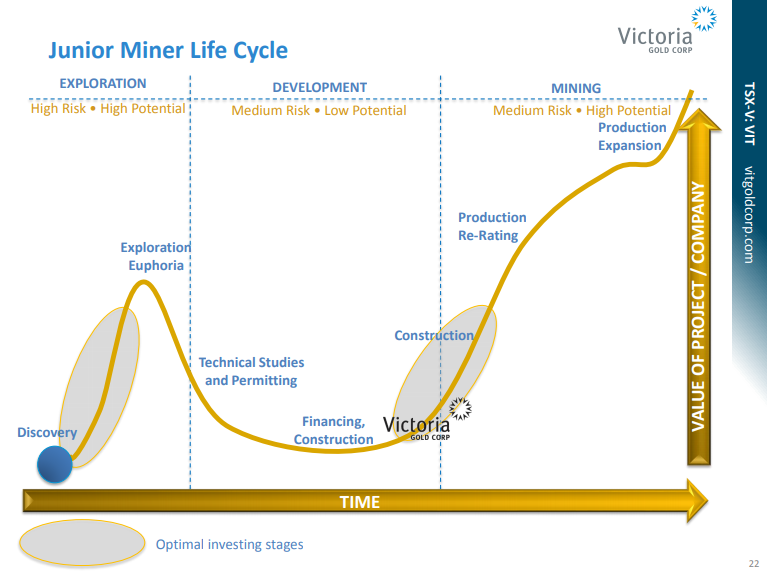 As the Yukon mining renaissance evolves over the coming months and investors begin to pay more attention to the success of Alexco and Victoria Gold, I anticipate money flowing into this emerging mining jurisdiction. I own shares in both Alexco and Banyan, and Victoria Gold shares are on my radar as well.